Rain - prepare to be defeated! Ever wish you could be a Samurai? 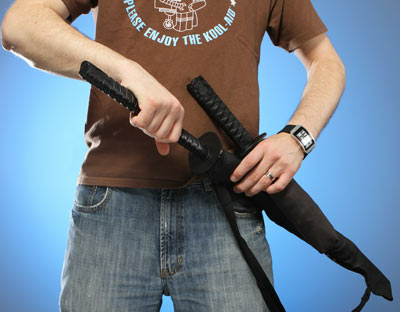 Bring out your inner hero with this Samurai Umbrella! Turn those dreary, rainy days into an adventure to save the world. The hilt and knuckle guard of a samurai's sword are the handle for this unique umbrella. Comes complete with nylon scabbard and adjustable shoulder strap. Samurai Sword Handle Measures: 39" long by 2.85" wide; 41" opened diameter A sturdy umbrella with the handle of a samurai sword Nylon "scabbard" included - with adjustable shoulder strap Push button opening.